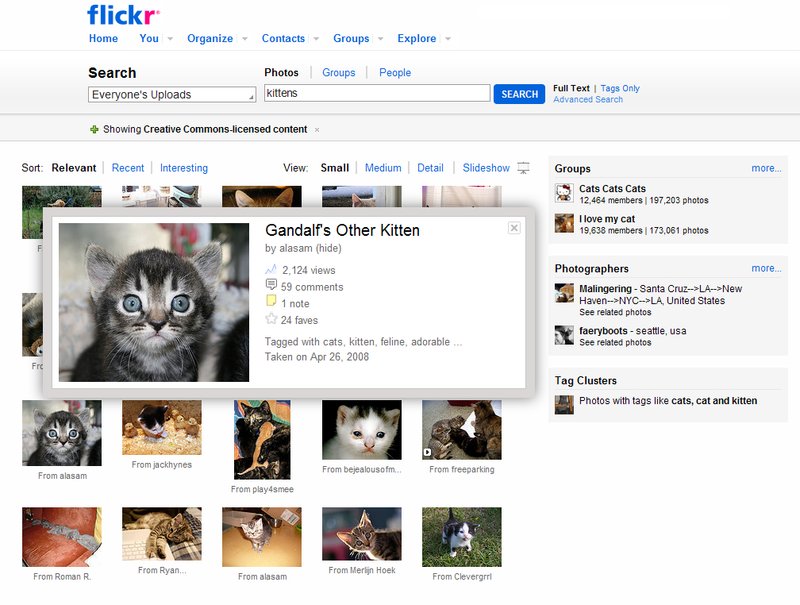 My favorite way to find photos (especially for publication in blog posts and use in presentations) saw a big upgrade today: Flickr’s search results page is now a whole lot easier to browse. When you search for photos by keyword on Flickr, you get a grid of thumbnails, each of which pops up full-sized versions in-page. (No more having to click to a new page to see what the image looks like close up and other stats.) You can set how big the thumbnails should be, and also sort results by Flickr’s magical (and very useful) “Interestingness” rank. When I need to find quality photos that are licensed for reuse in my own work, I hit up EveryStockPhoto (which includes Flickr photos) and Flickr itself–and almost always find what I need without even touching Google Images. Beautiful. Now if only they would upgrade the photo pages, my relatives still can’t figure out the anatomy of flickr without the expected “Previous” and “Next” arrows/buttons.